Bearer of one of the highest-selling shirts of all time, the Tri-Costa Korean Zombie Shirt (now a collector’s item), the first man to pull off a Twister in the UFC, and featured in arguable one of the best slugfests in the UFC in his fight against Leonard Garcia, “The Korean Zombie” Chan Sung Jung is back and this time, he will be facing Jose Aldo at UFC 163 for the UFC featherweight championship belt. Zombies fight in style, which is why he will be rocking the Venum Korean Zombie UFC 163 Fight Shorts in his fight with one of the best fighters in the world! The Venum Korean Zombie UFC 163 Fight Shorts feature a zombie apocalypse theme in a very unique way. A lot have tried but this is definitely the ‘cleanest’ and best way that this theme was ever presented on a pair of fight shorts. While it features bloody hand marks and chains, it doesn’t seem like the design is over the top at all. It blends in real well with the Venum and Korean Zombie graphic on the right leg of the shorts. All the graphics on these shorts are sublimated to make sure that the design looks brand spankin’ new, even after numerous washes. The Venum Korean Zombie UFC 163 Fight Shorts are constructed with ultra-resistant microfiber which feature antibacterial properties. While it may protect you from mat diseases, I cannot say the same for Korean Zombie fever. These also allow for a full range of motion with the 4-way stretch fabric in the crotch area, along with the side splits and seams. 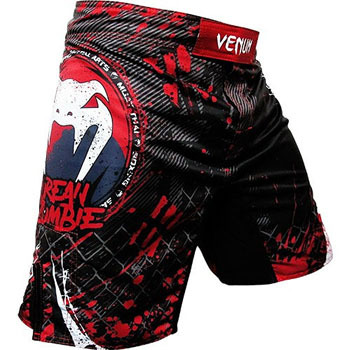 The Venum Korean Zombie UFC 163 Fight Shorts are available at MMA Warehouse.